German melodeath sextet Emergency Gate is a band that you will either think is really great, or just another melodeath clone band. I tend to lean toward the latter. On "The Nemesis Construct," their fourth album, the band takes the form of a slightly thrashier In Flames. But the Swede's influence on Emergency Gate is glaringly obvious. But for a German outfit, Emergency Gate display a touch of the Gothenburg sound or a Scandinavian influence. Their use of keyboards are present, but they're only there to accentuate the music and isn't as dominant as Children Of Bodom or Dark Tranquillity. Ex-Suidakra singer Matthias Kupka's vocals are a mix of aggressive and clean parts. He let's loose some good screams. Before Kupka's arrival, the band's sound was more power metal with thrash/punk influences. The band do create some tight riffs along with adequate keyboard accents and samples. The melodic hooks are pretty catchy. The choruses are where the In Flames influences come in. 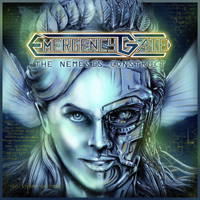 I think Emergency Gate's earlier releases showed more diversity and originality, before they changed to the melodeath style. For me, nothing makes me want to keep playing the CD over again. By mid-point through the album, I had already heard it all before. If you like later-era In Flames, then Emergency Gate just might be for you.